Securely joins panels without tools. Non-removable from front, removable from back. Several size options available to accommodate wide range of panel thicknesses. Installation: When fastener is pressed into hole, prong arm compresses and then snaps back as it passes through. 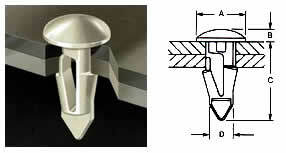 The two panels are securely retained between fastener head and shoulder.